Learn new and exciting soccer skills with Coach Ken. We have a proven record of helping kids achieve their full potential as soccer players. Our coaches are knowledgeable and passionate about the game. All lessons are age-appropriate, challenging and fun. All levels are welcome. Equipment Note for ALL Coach Ken’s classes: Shin guards and water are mandatory; sunscreen recommended. Coach Ken’s Soccer: 4-5yrs Young players are introduced to soccer in a positive environment and they eventually play the real game. They learn FUNdamental touches and moves. They enjoy running through “the obstacle course” of speed ladders, hurdles, and flags, which builds their coordination, speed, and stamina. We emphasize ball control and acquiring movement on and off the ball. 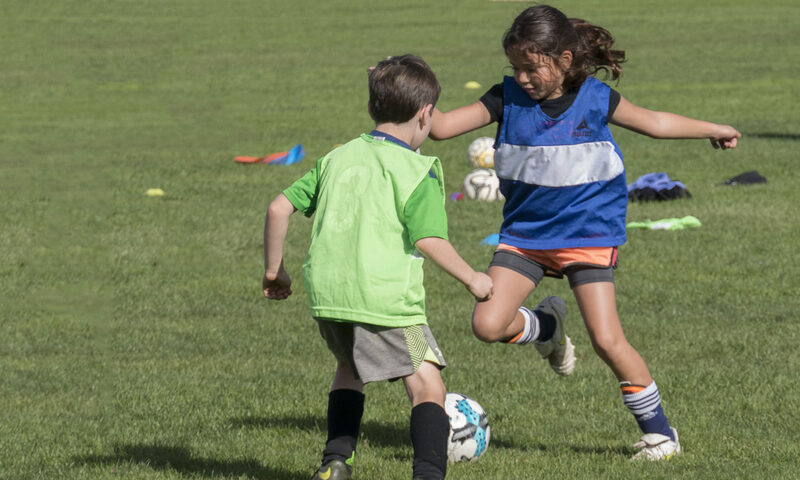 Kids learn to use all foot surfaces, plus basic fakes and moves to get around opponents. We use 1 versus 1 matches and conclude daily with a scrimmage. Kids separated into smaller groups by age and ability. All classes missed due to rain out or holiday are made up at the end of the season. In case of rain out, we send out a rain out email at least one hour before start of class, so please make sure to provide the best email to reach you when you sign up.